People ask me how I get my ideas. I joke and say, “I’m just full of it.” but the truth of the matter is I “see” possibilities in various common and uncommon items. One of my best friends once sent me a napkin holder made of wood in the shape of a carved flamingo. She said, in essence, if I was so good make something of this. I did. I looked at the theme of the flamingo and envisioned where flamingos lived. From there I was able to develop a color palette. With color as my jumping off point I could now concentrate on the fabric and beads to use. I drafted a purse pattern and used turquoise velvet as the purse body. 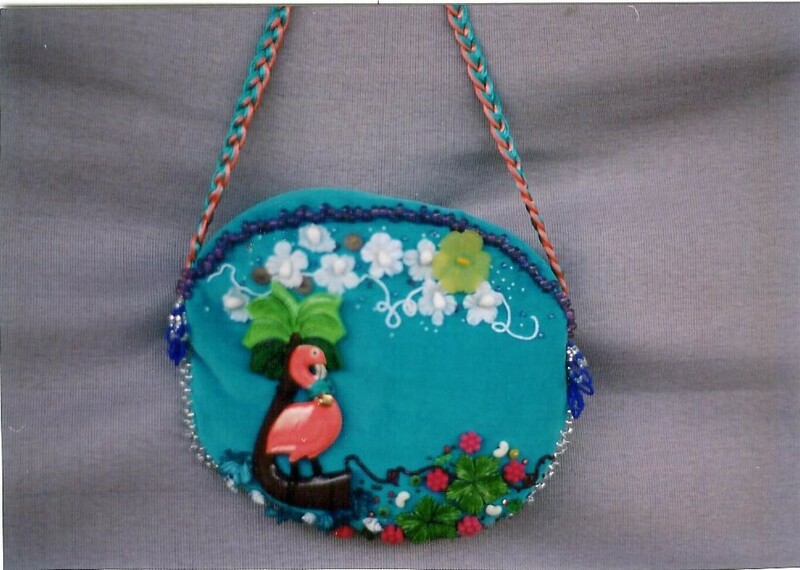 I placed the flamingo, sans napkin holder, to the left of center on the front of the purse piece. I sewed this on. Once I had my focal point in place I could add details. I gave the flamingo clouds in the sky using white silk flowers and white beads. To simulate a hot sun I added a yellow plastic flower shaped button in the sky. To finish the clouds I tacked white cording in swirling patterns to simulate movement. Of course flamingos need a place to stand and what better than in a sweet bed of flowers and leaves. I used large green plastic leafs and hot pink plastic beads. I sprinkled in a few off white beads for interest and added brown cording as a type of shoreline. 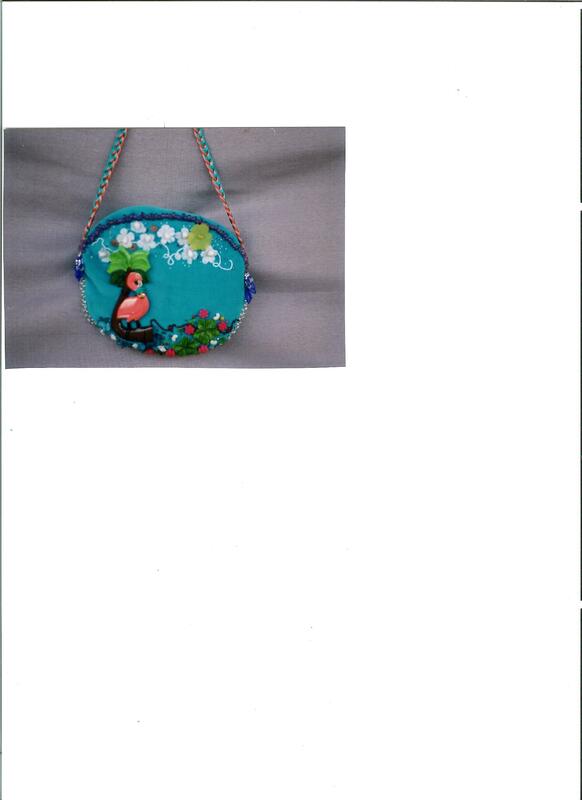 For the purse handle I braided turquoise and coral #2 rattail cording. The colors matched the color of the velvet and the flamingo which draws the whole piece together. All my purses are finished at the seam line with beading. I used crystal beads (6° size)for the bottom and the same size for the top changing the color to purple. If confused about the different color my rational is this: My work is an art piece. The purple acts as a “frame”. The different color is also in keeping with a tropical theme. This piece took about 40 hours. It has a hidden zipper in the top, it is lined, it has an inside and outside pocket. I gave this to my friend for her birthday. She was stunned.